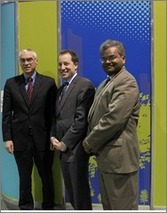 Ventower Industries in Michigan - helping create green power and new jobs! 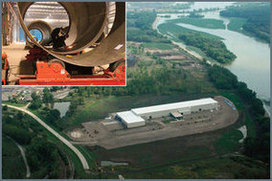 Ventower Industries is the home of a green energy manufacturer located on a former industrial waste landfill at the Port of Monroe, Michigan's only port on Lake Erie. Ventower became operational in late 2011 and is a full-service fabricator and supplier of industrial scale wind turbine towers. The Port of Monroe catalyzed the project by marketing the site's attributes of being able to provide service by rail, interstate highway and port. 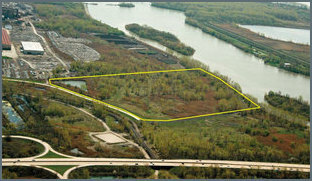 Significant construction and environmental obstacles posed by the site were overcome by a green remediation strategy and Brownfields funds. Cleanup costs were approximately $5 million and primarily funded by a combination of $2 million in loans and grants from the Michigan Department of Environmental Quality and a $2.25 million loan from the Downriver Community Conference (DCC) to the developer. The source of DCC's funds was a Brownfields Revolving Loan Fund (RLF) grant. Rather than removing contaminated soil, exposure mitigation techniques were used to address human health risks posed by the site. The green remediation strategy consumed fewer resources, produced fewer emissions, and minimized off-site impacts when compared to a traditional "dig and haul" approach. Exposure mitigation included the installation of direct contact barriers over the entire site including a vapor intrusion barrier beneath the foot print of the building, and a specially designed building foundation system to stabilize the soils and provide the necessary support for the building infrastructure. Total investment for the project was approximately $30 million. It included funds and incentives from: 1) Brownfields Tax Increment Financing; 2) Michigan Strategic Fund "Choose Michigan" grant/loan for equipment purchase; 3) Small Business Administration Section 504 loan guarantee; 4) U.S. Dept. of Energy Tax Credit for advanced energy projects; 5) Michigan Brownfields Business Tax Credit; and 6) Michigan Economic Growth Authority job credits. Ventower has 80 full time employees and is operating multiple shifts 24 hours/day, 5 days/week. Its current annual production capacity is 100, three-section towers. Plans for expansion will increase annual production by 50% for 2014. Ventower has a large contract with General Electric for the production of towers that will remain in Michigan thus creating additional jobs for installation, and future operation and maintenance. Another distinction of this project is the coordinated development of a program with Monroe Community Jobs to educate and train students for work in the wind turbine industry. Please welcome Dondra Ward as the new Project Manager for ACRES. Previously, Dondra worked in EPA's Office of the Chief Financial Officer analyzing the Agency's progress towards meeting its environmental goals, and communicating these results to the public and Congress in a meaningful way. In her new role, Dondra's number one priority will be to work collaboratively with each Regional Data Coordinator and Project Officer to identify system enhancements that will help recipients report activities and successes in ACRES. She will also serve as Brownfield's primary Data Quality Steward. Dondra is looking forward to an exciting year in Brownfields cleanup and redevelopment and is eager to learn more about each community project. 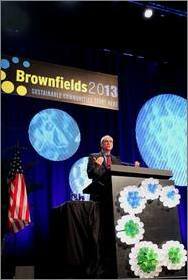 Anyone interested in viewing one of the plenary sessions at Brownfields 2013 can watch them online at: http://www.brownfieldsconference.org/en/Page/42/Plenary_Speakers. A big thank you to the regional staff that manually researched approximately 2,000 older ACRES properties that had known lat/long issues. Most of the errors were created back in the day when lat/long was manually calculated. The errors have been corrected. With the auto generation of lat/long based on a property's address, location information is now extremely accurate. But if you still need to tweak a location, it's easy to do with the lat/long Edit feature. This important field has three options (one must be selected): Yes, No, Unknown. If you select "Unknown", ACRES will prompt you to select a reason from a list of possibilities (required). Two new contaminant classes have been added: Pesticides and SVOCs. Two new media types have been added: Building Materials and Indoor Air. A help icon has been added to the Building Materials field to provide clarification for this option. It is defined as "Hazardous building materials include materials that were once intentionally used to construct, renovate, or maintain a building that are now known to be hazardous or contain hazardous substances. Common examples include asbestos, PCBs, mercury, and lead paint. "Other" Metals and Contaminants now have selection options to make it faster to add these details. A new text field, Activity Funded (optional), has been added to both the Cleanup Funding Information and Redevelopment Funding Information screens to provide more space to describe the activities. A new cleanup funding type, Cost Share, is available on the Cleanup "Add Funding" and "Update Funding" screens. It is available ONLY for Cleanup and RLF cooperative agreements. Note that this is not a leveraged fund. The "Add Funding" and "Update Funding" screens for RLF cooperative agreements ONLY, have been updated to include a new field Subgrant Issuance Date (optional). It is similar to the RLF loan issuance date and has been added so that the subgrant can be entered into ACRES during the time period before an actual draw is made under the subgrant (since dollars are entered for draws, not loan/subgrant amounts). The "Future Use and Estimated Acreage" and "Actual Greenspace Acreage and Type" fields have been merged into one table "Future Use, Planned, and Actual Acreage". The old information for Actual Greenspace acreage data has been merged into the new table and any text previously entered has been moved to the Property Highlights text box (very few properties had "actual" data to be merged). The column for multi-story building data now has an area to allow total building square footage to be captured. Verification has been added to ensure that the total number of participants completing training is not greater than the number of participants entering training. Also, average hourly pay is required for reporting quarters that have participants obtaining jobs. Help text has been added for several of the measurement fields, including the Weighted Average Hourly Wage. You'll also notice the layout has been updated and is easier to read. When a CAR navigates to a specific Cooperative Agreement (CA) and submits a work package for review, ACRES will now return to the CA Home page (ACRES used to return to the CAR Home page). This improvement will save CARs time when they want to create/submit more work packages for the same CA, which is often the case. Thanks to all of your hard work we exceeded our FY 2013 program goals before the end of August. Of note, the Jobs Leveraged are more than twice the target number and Acres Ready for Reuse is 50% higher than the target. This is work we can all be very proud of!